Note: This article was initially published on the WUFT site on 2/20/17. Tillissa Barcia sat at a Starbucks in Downtown Gainesville on Saturday morning. Although she was lounging with her husband Steven, and her two children Austin and Abery, none of them were sipping a coffee. This Starbucks is what Pokémon Go players refer to as a PokeStop. Two more of the item-spewing stations surround the street corner. For Barcia, these frequent “Pokémon Go adventures” allow the family to spend quality time together, regardless of her post-traumatic stress disorder and her daughter’s cerebral palsy. On Thursday, the mobile game Pokémon Go launched its largest update since its initial release in July 2016. Not only were 80 new Pokémon made available to catch, new gameplay features were implemented as well. Despite a decline in popularity nationwide, Pokémon Go has remained alive in Gainesville. Barcia and her husband serve as two of the three administrators of Pokémon Go: Gainesville, a growing Facebook group centered around the game. Barcia said the group has grown steadily from 10 to 715 members as of Monday. Despite the size of the group’s membership, Steven said there are only about 50 players who actively post. He said posting is not the only mark of participation, however. The majority of group members use the page to find tips and advice. “They post what they find there so other people can use it,” Steven said. Ken Humphlett, group moderator and owner of Dependable Ken Tech Support, said the Gainesville community hasn’t declined, but redirected itself. When starting the game, players may choose to align themselves with one of three teams: Mystic, Valor, or Instinct. Teams then battle each other to gain control of “gyms”, which represent real-world territory. Humphlett said this shift in community focus from catching Pokémon to taking gyms has created some hostility. “As more people get into gyms, it creates a competitive dynamic,” he said. Both Humphlett and Barcia agree that the fun has come back to the game with the implementation of Pokémon from the second generation of the series. Although every member of the family expressed their excitement, the Barcias said they didn’t require a new generation to renew their interest in the game. Other than medical appointments for her children, Barcia said she used to rarely leave the house. After getting involved with Pokémon Go, she begged for excursions. “This is helping my PTSD, I’m going out as a family to do this,” she said. 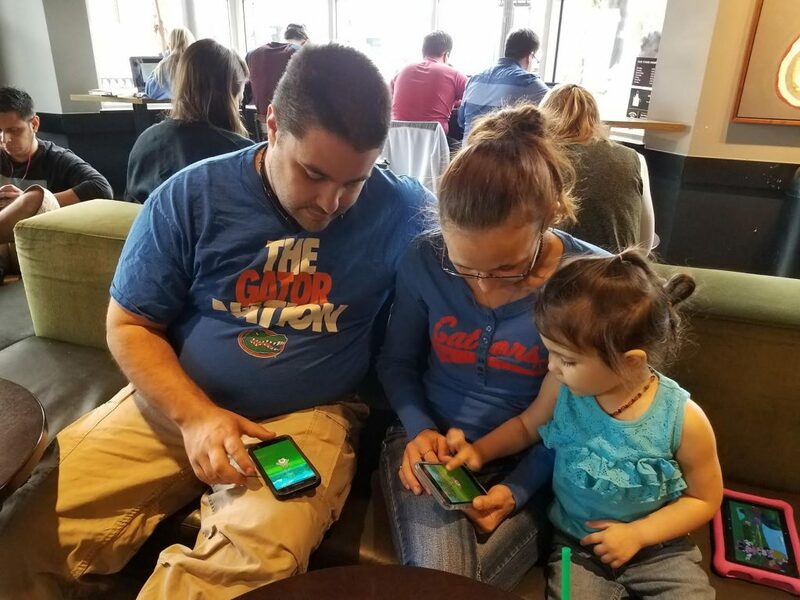 Kelli Granade, the office manager of the University of Florida’s Linguistics Department, also said she uses the game to spend time with her family. She said one of her fondest memories is running around her neighborhood with her husband and son, trying to catch the rare Pokémon Snorlax. Humphlett said he had no interest in the Pokémon franchise prior to the game’s release. It was the two youngest of his five sons that convinced him to download the game. “Seeing the excitement on their faces when they catch something new,” is what he said keeps him coming back to Pokémon Go. As her son wandered around the coffee shop trying to catch a new Pokémon, Barcia guided her daughter’s fingers across the screen of her phone. Steven paralleled the motion on his phone; they were all laughing.